A healthy, attractive smile can dramatically boost your self-confidence and open doors in your private and professional life alike. At Blooming Smiles Dental we give you the opportunity to have a new smile that has been designed to look better in many ways. It may align crowded teeth, close gaps, reduce protrusion, whiten, reduce a gummy smile, widen a narrow smile, change the length or shape of teeth, replace missing teeth or any combination of the above. Maximize Your Beauty with a Perfectly Designed Smile! When designing your smile we keep ourselves to the most important principles. You can find some principles below. IDEALLY THE SMILE LINE SHOULD BE ALIGNED SO IT IS PARALLEL TO THE HORIZONTAL. THIS TENDS TO BE PREFERABLE EVEN WHEN THE EYE LINE DOES NOT COINCIDE WITH THIS LEVEL. SYMMETRY AROUND THE CENTER LINE IS OF GREAT IMPORTANCE FOR AN AESTHETICALLY PLEASING SMILE. EVEN WHEN THIS IS NOT 100% POSSIBLE, THE ILLUSION OF SYMMETRY SHOULD BE CREATED. THIS CAN OFTEN BE ACHIEVED BY ENSURING SYMMETRY OF THE TWO FRONT TEETH AND OTHER TEETH CLOSE TO THE MID-LINE. FURTHER AWAY FROM THE MID-LINE, ASYMMETRY IS NOT SO NOTICEABLE. THE SMILE LINE CONNECTS THE BITING EDGES OF THE TOP TEETH. IDEALLY THIS LINE SHOULD FOLLOW THE CURVE OF THE LOWER LIP. A FLAT SMILE LINE LOOKS AGED AND WORN. A CURVED SMILE LINE LOOKS MORE YOUTHFUL. WOMEN TEND TO HAVE MORE CURVED SMILE LINES THAN MEN. THE GUM LINE CONNECTS THE HIGHEST POINTS OF THE GUM LEVELS OF THE UPPER TEETH. IDEALLY THIS LINE SHOULD FOLLOW THE LINE OF THE UPPER LIP, TO ENSURE REASONABLE GUM EXPOSURE AND OPTIMUM DISPLAY OF THE TEETH. A SMILE OF NORMAL WIDTH ALLOWS ONE TO SEE THE IDEAL PROGRESSION FROM FRONT TO BACK TEETH. IN A NARROW SMILE THE SIDE TEETH ARE OFTEN IN SHADOW SO THE FRONT ONES APPEAR TO STAND ALONE. THERE ARE ALSO GUIDELINES AS TO THE IDEAL PROPORTION OF EACH INDIVIDUAL TOOTH. FOR EXAMPLE THE RECOMMENDED IDEAL WIDTH TO HEIGHT RATIO FOR THE TWO FRONT TEETH IS: 0.7:1. AT THE SAME TIME IT IS ALSO ESSENTIAL TO RESPECT THE IDEAL THE RATIO OF THE SIZE OF THE TEETH. 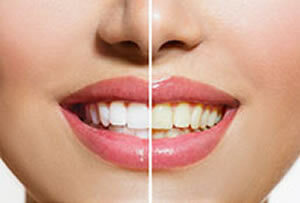 DESIGNING YOUR NEW SMILE, WE CAREFULLY PLAN WITH YOU WHICH SHADE OF WHITE YOU WOULD LIKE YOUR NEW SMILE TO BE. THE IDEAL SHADE HAS TO MATCH EACH PERSON'S TASTE, SKIN COMPLEXION, GUM AND SKIN COLOR. An attractive smile is not only one of the benefits! Preventing physical health problems is just as important. Without treatment, orthodontic problems may lead to tooth decay, gum disease, bone destruction, and chewing and digestive difficulties. A "bad bite" can contribute to speech impairments, tooth loss, chipped teeth, and other dental injuries. Porcelain Veneers are the most popular cosmetic procedure requested by actors, celebrities, models and performers. A veneer is a new front surface for a tooth, custom made from porcelain. We offer porcelain veneers to give you an improved smile in just a few visits, whether your teeth need to be straightened, have spacing, or have a compromised appearance because of a crack or a dark color. Laser whitening promises to whiten your teeth by up to 8 shades with the safe procedure we carry out in 1 hour at our Midtown office. This option is much more effective than the over-the-counter whitening products. Time, tea, coffee and wine are just a few things that cause your teeth to yellow and discolor. Laser teeth whitening is a bit like a facial in that it helps to unlock pores in your teeth, gently removes stains leaving the teeth whiter. Laser teeth whitening can take years off your appearance and the effect can last up to ten years.